I started to write a diary again. Actually writing and collecting diary is one of my old hobby. Since I have this blog, I'm starting to write on my diary rarely. Until finally I really stop all my activities relate to write on my diary. Eventhough writing on my diary is much more easy and set me free, you know the privacy of diary book is different with this blog. While I set this blog for public, but my diary book is just for me. Diary is my privacy. So, I can share every single thing, feelings, dreams, thoughts, everything in my diary without burden and worrying that someone else can read my diary. But, I don't know why me likey to post on my blog rather than writing on my diary. Recently I decided to have a diary again, but its much more different with my old diaries. It calls visual diary. Me really likey having a visual diary. Because there are so many ways to express yourself through visual diary. It could be through photos each day of your life, skecthes and drawing, collage pictures you found on a magazines, glueing things on paper, and so many others. I myself bought a skecthes book for me to be my visual diary. I put ideas, feelings, wishlist, what happened to me in a day, and others through simple writings, drawings, glueing things, and others fun way that comes to my mind. having visual diary is much more fun than just having a common diary book. For me visual diary is much more artistic because I can put what's on my mind through so many ways while in a common diary book there's just date, place, letters, words, and sentences on your diary. I joint the coolest photography school ever named "Kelas Pagi Jakarta". It was one of the busiest day I ever had. Nobody's perfect, but I think I found love in my hesitation. @annisa: hahah. no, its good. I can get your point. I agree, reading diary often makes me got myself questioned like you do. But however it was good old days. I kept a diary too, but now blog is the closest thing to writing. I have to admit, i miss my diary so much, but *sigh* people change. Persons who overflowing with creativity and ideas need many ways and media of expression ( otherwise they would explode :). 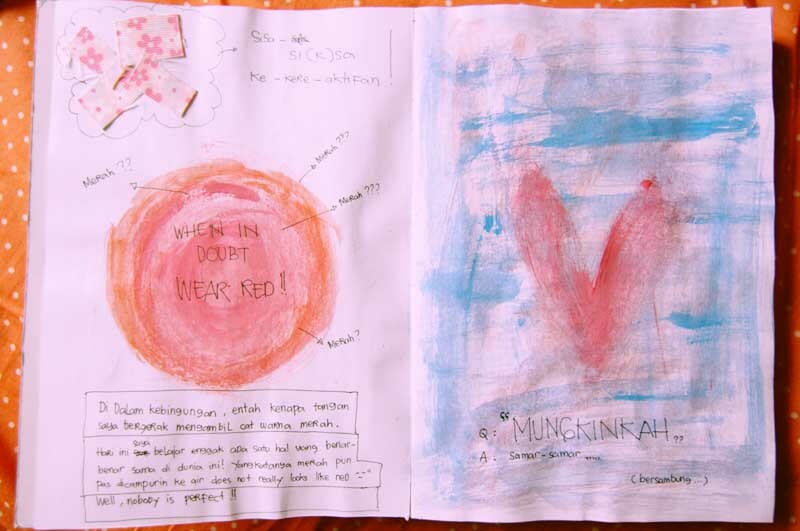 This visual diary may be a splendid new tool for an artistic mind to let all the world know...Though not all the world reads Bahasa Indonesia :(. 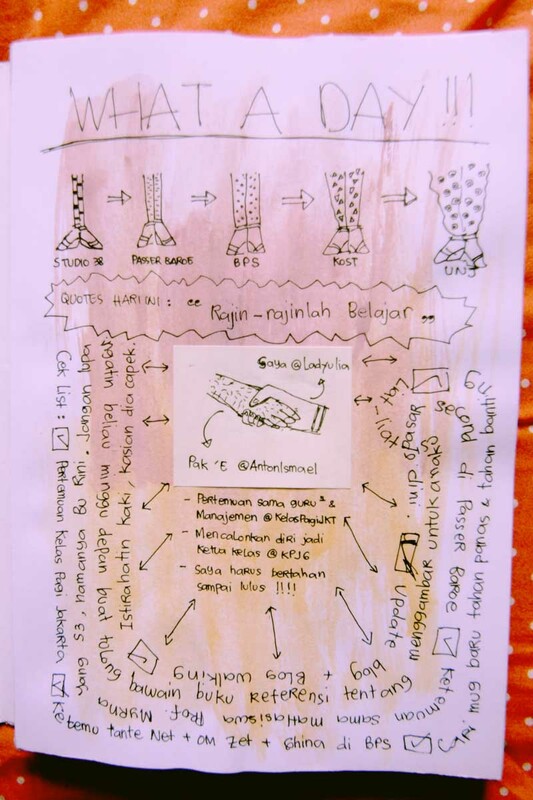 Blognya bagus ya, foto dan tulisan nya keren2 dah... tapi kalau boleh tau ni blog udah SEO blum ya ?